The gallery images below show some of the steps taken in the process of making our jerky. We take pride that it is all handmade for quality. We believe that a picture is worth a thousand words. The images in our gallery above show our jerky products to perfection. Our jerky is moist and chewy ! Our jerky is super tasty ! We are 100% Australian owned and made. All our jerky products are handmade at our Narangba kitchen. You can be assured of freshness and quality. 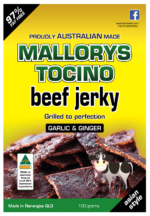 We believe we have the best Brisbane Jerky available. Our customers think so too. You can read their reviews here, or on our social media pages. We would love to add photos of our customers enjoying our products. Feel free to send us your photos of you enjoying our jerky, and we will add them here. You could even let us know why you purchase our products and your best place to enjoy them. ie Just as a tasty jerky snack, after a gym section, for camping trips etc.